Early September Frost – What is Going to Happen to My Soybeans? September 5, 2017 – Pinawa, Winnipeg, Whiteshell and Steinbach overnight forecasts, Environment Canada is stating there is a risk of frost. Whether or not there is yield loss in soybeans depends on two factors. One is how cold it gets and how hard it freezes. We won’t know the story on that until tomorrow. The other factor is the growth stage the soybeans are at and that is determined by examining the pods on the plant. It is all about the pods, so don’t get distracted by the condition of the leaves. The more advanced/mature the soybeans pods are, the less the potential yield loss. Frost during the R5 stage can reduce yield by 50%-70%. Frost at the R6 stage can reduce yield by 20%-30%. Frost at the R7 stage can reduce yield by only about 5%. At the R8 stage no yield reductions are expected. Dupont Pioneer has also put together a factsheet on frost damaged soybeans that is helpful https://www.pioneer.com/home/site/us/agronomy/library/frost-damaged-soybeans/. You will always find some variation around predictions of yield losses due to frost in soybeans. This is to be expected. There is no absolutely right answer. No crop is uniformly at one growth stage and every frost event is unique in how it plays out. The information above is merely meant to serve as a guide. Let’s hope we stay well above zero!! Submitted by: Terry Buss, Beausejour Farm Production Extension Specialist – Crops, MB Ag and Dennis Lange, Pulse Crop Specialist, MB Ag. Do you Have Potassium Deficiency? Several of our maturing crops are now exhibiting deficiency symptoms that are too late to correct, but important to address for next year. Potassium (K) is often overlooked in much of Manitoba due to our naturally high K levels in clay and clay loam soils. But deficiencies on lighter textured soils are increasing – particularly with soybeans. Potassium deficiency often shows up during pod and seed fill, since soybeans remove 1.4 lb K2O/ bu of grain, the heaviest rate of removal of any grain crops. As K is translocated out of leaves to fill seeds, the deficiency shows up as yellowing and later necrosis of the leaf margins. 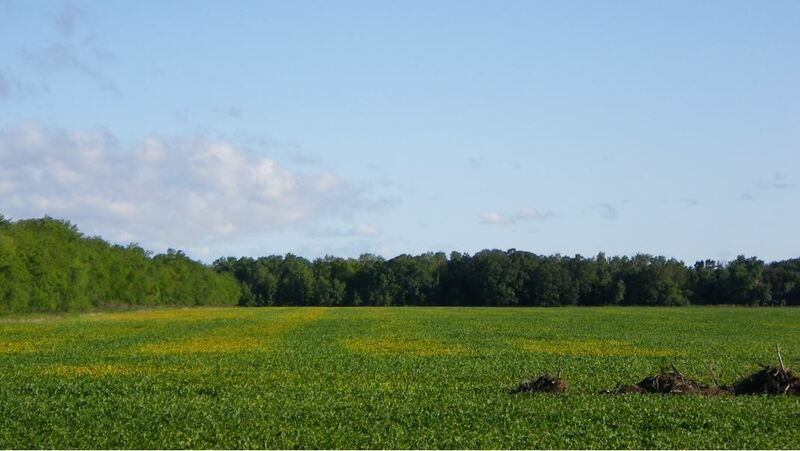 Sometimes odd strips occur of alternating deficient and normal soybeans occur in fields. These are often related to a previous canola or cereal swath that has had the K leach out of the swath into the soil beneath, and hence marginally increasing K supply in that strip. If either of these symptoms are observed, a K deficiency can be readily identified with a traditional soil K test and a recommendation will be made for future K fertilization. Picture 2: Alternating strips of varying potassium deficiency in maturing soybeans due to previous canola swaths. Remember!! You can’t apply post-emergent glyphosate – Unlike glyphosate-tolerant soybeans, conventional soybeans are not a clean-up crop for weedy fields. They are a crop that needs to be planted in fields that have already been cleaned up. Get in touch with your weed spectrum – If you have not done so already, determine what weeds are present or likely to be present in your conventional soybean fields. Are the herbicides you intend to use going to control the weed spectrum you have identified? A mismatch between weed spectrum and herbicides used is a frequent cause of weed control problems in conventional soybean fields. Did you take advantage of pre-emergent weed control opportunities? If so, how is that working? – The advent of pre-emergent soil applied residual products has been a benefit to weed control in conventional soybeans. If this is a tool you decide to use, it is important to assess its effectiveness before you do post-emergent applications to ensure that weeds you are assuming have been dealt with have been controlled. Amp up the Aggression!! Early and thorough weed control is key – Important regardless of the type of soybean you are growing. Research has demonstrated the critical weed free period for soybeans is emergence to the third trifoliate, where the removal of weeds provides the greatest protection of yield potential. Be timely with control and selective with products that may provide some residual control for an extended weed free period. Overgrown weeds are less susceptible to herbicides – this can lead to growers dishing out more money on higher cost options that might not work due to size of plants. Please take note that some herbicides can cause crop damage if they are used at the wrong growth stage. In this competitive fight for yield, you don’t want to set back your crop. Assess the effectiveness of herbicide applications and adjust your plan – Fields should be scouted after each herbicide application to assess effectiveness. If weeds have shown up that the previous herbicide would not have controlled, you might have to change products for your next application or add extra herbicide passé. Were the weeds that you expected to be controlled, actually controlled? Don’t assume that you have dealt with target weeds until you see the evidence. These post-spraying inspections are key opportunities to detect the development of herbicide resistant weeds before they get out of hand. Weed control in conventional soybeans is going to cost more – Seed may be cheaper, but the cost of an effective weed control program in conventional soybeans is almost always more expensive than in glyphosate-tolerant production. But remember, poor weed control remains the #1 threat to maximizing yield and profit in conventional soybeans. Weed control is a key point of investment in this crop and there are no shortcuts if the weed control situation demands action. Non Xtend soybeans (and other crops) are easily damaged by dicamba – dicamba on sensitive crops always causes crop damage with very dramatic looking symptoms. As glyphosate -tolerant soybeans made up the majority of acres in the past and usually only sprayed with glyphosate, drift went unnoticed. The addition of Xtend soybeans to the cropping mix will be a reawakening to anyone who has gotten careless. Should your pre-emergent application have been the one that included dicamba? – preferred timing for dicamba containing herbicides for use on Xtend soybeans is pre-emergent. Research has demonstrated the critical weed-free period in soybeans is emergence to the third trifoliate, early weed removal provides the greatest yield potential. Additionally, dicamba provides residual control for some weed species during that critical period. Another important point is, chances of application mistakes like drift on sensitive crops are greatly reduced during pre-emergent applications. Only use herbicides specifically designed for the Xtend system – do not tank mix dicamba and glyphosate that you might have on hand in an attempt to make “homemade” herbicide for Xtend soybeans. The herbicide manufactured is designed specifically for use in Xtend soybeans, with reduced levels of volatilization, to prevent herbicide drift. Keep in mind the reports on the U.S. experience in 2016. Homemade concoctions are a very bad idea, plain and simple. Use nozzles delivering extremely coarse to ultra coarse spray droplets (volume median diameter of 450 microns or more) as defined by ASABE standard S572.1 and as shown in the nozzle manufacturer’s catalog. when winds are below 3 km/h or above 15 km/h. All soybeans look alike – know what field you are in – there is no way to visually discern between the different types of soybeans. When in doubt, make sure that the applicator is in the right field. Herbicides specifically designed for the Xtend system applied to Roundup Ready or conventional soybeans will cause significant crop damage. Additionally, knowing the types of soybeans in the adjacent fields is important to indicate increased risk for off target crop damage. Remember, dry beans look like soybeans from far enough away….never make assumptions. Sprayer cleanout requires careful attention – If producers are growing two or more types of soybeans on their farms, careful consideration has to be given to sprayer cleanout as they move between soybean fields. Even a small amount of dicamba will serve as a contaminant in the next spray load being applied, causing significant damage. Especially if you have only grown Roundup Ready soybeans in the past, recognize that the situation has gotten more complicated. Most growers will roll their beans shortly after seeding in order to prevent stones from entering the combine at harvest time and to make harvesting easier and quicker. On dry springs when soil conditions could lead to soil drifting a grower can wait and roll there beans after they are up and are at the first trifoliate stage..
Do not roll at the Hook Stage- This is when beans are first emerging. Do not roll in the morning wait until air temperature are around 25C before you start to roll to avoid damage to the plants. Check for damaged plants to ensure plants are not breaking off. If damage is too sever wait for a warmer day. The attached video outlines some of the reminders about rolling beans. So we had a Frost on our Soybean, Now what? The first step in accessing frost damage is asking how cold it was last night. A light frost of -1°C for short durations may clip off a few off the top leaves with no effect on yield. The concern begins when a killing frost at least -2°C occurs for an extended period of time. In this situation you will see frozen leaves and pods throughout the canopy. This may cause quality issues and yield reduction if the crop has not reached full maturity. What growth stage are your beans at, see http://www.manitobapulse.ca/soybean-staging-guide/ as a reference. A killing frost at the R8 growth stage will see no yield or quality loss. The R8 stage is when the leaves have dropped off, all pods are brown, and seeds rattle within the pods when plants are shaken. If however your beans are at the R7 growth stage, (which means one pod on the plant has reached its mature color), research has shown yield loss can range from 5-10 % dependent upon the severity of the frost. Quality issues in the way of green seed may also occur. Finally, if your beans are at the R6 growth stage-(this is where pods containing a green seed that fills the pod cavity at one of the four uppermost nodes on main stem), yield losses can range from 20-30 %. You will also have green seed issues which can also lead to marketing concerns. There are a few areas in Manitoba where the beans are at the end of this R6 growth stage. Most of the beans in Manitoba are at the R7-R8 growth stage. A light frost should not affect yield and quality for these beans. If beans were at the R6 growth stage and a hard frost occurred yield and quality losses would be noticeable. Picture: Light frost damage on soybeans near Hamiota, 2016. HOW DO I CONTROL VOLUNTEER CANOLA IN MY SOYBEAN? 1.5 plants/m2 in wide row soybean. Although economic thresholds (ET) such as these don’t consider seed return, this is generally not a concern for canola given it’s prevalence in our crop rotations. If your volunteer canola populations exceed the ET, the U of M researchers also assessed the effectiveness of various post-emergent herbicides (Table 1). †Control of volunteer canola by the herbicides listed in table 1 are based on comparisons of treated research plots. It’s unlikely that any of these options will provide full control of bolting or flowering volunteer canola. Another consideration: use of these herbicides on larger volunteer canola may only set plants back, resulting in later flowering canola that may cause issues during soybean harvest. Previous research by Dr. Gulden has shown that one of the best ways to manage volunteer canola is by limiting weed seedbank additions from canola harvest losses. Slower combine speeds while harvesting this year’s canola is a good way to reduce volunteer canola populations in future soybean stands. Originally posted May 8th and 30th, 2015…..re-post May 13, 2016. Don’t assume because there is frost (or snow) on the ground, that your emerging crop in dead! Short frost = < 2 hours, may not cause much damage if frost is light (above -1 to -2°C), crop type and staging is tolerant, conditions wet and crop has become acclimatized. Short frost = < 2 hours, but hard frost (lower than -2°C), crops like canola are more sensitive to longer frost vs. cereals, damage can be variable in field and across area. Long frost = > 2 hours, whether frost is light or hard the longer the negative temperatures the more time for damage to happen. Tolerance by crop type varies. Cloudy and wet – prior to a frost, cool temperatures slow plant growth and ‘hardens’ plants off, which will help them tolerate a frost. Also wet soil helps buffer the cold air effects on the plants, as wet soils change temperature slower than dry soils. Sunny and dry – The combination of a dramatic drop in air temperatures when plants are actively growing then a brilliant sunny day after the frost event is where we have seen the most damage. Scouting after the frost (24 and 48 hours) is very important though to assess extent and percentage of field injury. Spring Cereals – more tolerant than other crops types, can tolerant to temperatures as low as -6°C as growing point below ground until the 5 leaf stage. Winter Wheat – can withstand very low temperatures for a short period of time (-11°C for less than 2 hours) up until the tillering stage. Corn – smaller then V5, will recover from light frost as growing point below ground. Leaves probably will be killed, but plants will recover if the growing point ok.
Oilseeds – environmental conditions impact frost severity on susceptible canola and flax cotyledons. Resiliency increases at the 3-4 leaf stage (canola) or 2nd whorl (flax). Sunflowers are fairly tolerant up to the V4 stage. Pulses – peas are most tolerant, then soybean, edibles bean are very susceptible even before emergence. Field pea crops are rarely lost to frost. Soybean are more sensitive, but the smaller the soybean plant the more tolerant they are – from emergence to cotyledon can withstand short light frosts. Scouting should start 24 – 48 hours after the frost and continue for the 5 days following the frost event. Look for leaves wilting, looking “water-soaked” or see “frost banding”. Watch for new growth in the plant. You do not want to see plants wilted and not perking back up or pinching off on the stem near the growing point (canola, flax, soybeans). Also assess the area affected by frost, small areas or a few plants damaged are ok, as other plants emerged (or just emerging) will fill in those spaces. Large dead areas may need to be re-seeded. If in doubt of what look for, call your local agronomists, local FPE Specialist with Manitoba Agriculture or the Crop Industry Branch. For more specific details on what actually occurs to plants with a frost and crop specific details and symptoms to look for (and how long after a frost to do assessment) see Manitoba Agriculture’s Spring Frost Damage Bulletin. Are your Soybean leaves looking scorched? During seed fill, potassium deficiency symptoms is most commonly observed in soybeans. Potassium is a mobile nutrient, meaning that as deficiency occurs, usually lower leaves are scavenged of potassium in order to support new growth. This early season deficiency appears as yellowing and later browning of lower leaf margins (Figure 1). Soybeans remove alot of potassium/acre in the seed – about 1.4 lbs K2O/bu. As seeds fill, some of the potassium that is stored in the plant leaves is mobilized for movement to seeds.. Then one may observe deficiency symptoms appearing on upper leaves (Figures 2 and 3). The likely areas with potassium deficiency are lighter textured or sandy soils, peat soils or cropping systems where past potassium removals have been high without replenishment. These symptoms can be verified with tissue testing but should ultimately trigger soil sampling to determine the rate of potassium to be applied. Why Are My Soybeans Yellowing? With cooler and wet conditions, iron chlorosis has been showing up in a number of soybeans fields around Manitoba. IDC is the plants inability to uptake iron due to high soil pH, high carbonate levels and high salt levels. 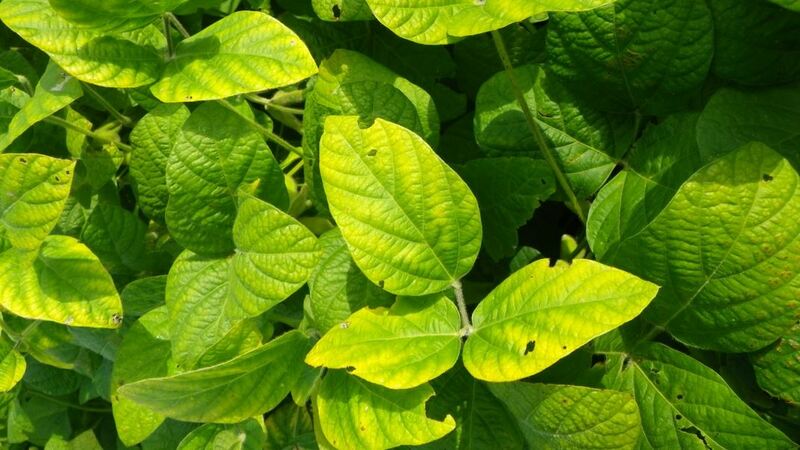 Initially the soybean leafs will turn yellow and as symptoms progress growers may note interveinal yellowing. The dark greens veins of the soybean leaf is a tell tale sign of IDC. If symptoms are severe you will see necrotic tissues on the leaves and short stunted plants. If growers do see this occurring in fields the best thing to do is to take the long way home from town for about a week until you get a bit of warmer weather so the beans can grow out of this condition. For future years growers can use the IDC ratings listed in the soybean table of seed Manitoba to help choose a variety for a particular field that is rated higher for tolerance to IDC.